Despite what many aggregator sites, critic’s scores and box office returns might say, the Universal Soldier series is one of the most underrated and manly out there. The series has had six entries, including a failed television show that starred Gary Busey. Jean Claude Van Damme has appeared in all movies bar the DTV sequels in the 1990’s, Dolph Lundgren has appeared in three. Let’s take a look at the history of this series. The script, Universal Soldier, undergoes significant changes. Primarily, word comes down to change how the US Military is represented in the feature. In the new shooting draft, the plot point that the US Military hires mercenaries to deliberately create a hostage situation is removed. The false flag angle is ditched. Originally, they would kill the mercenaries then tell the public that they were terrorists in order to gain backing for the UniSol project. Additionally, Dolph Lundgren’s character would originally have massacred all civilian witnesses to the UniSols’ rampage throughout the movie. Production commences on Universal Soldier. It is Roland Emmerich’s first movie in the United States and the first movie where Jean Claude Van Damme and Dolph Lundgren appear together. A private jet flies into Colorado. Universal Soldier is being filmed at the Hoover Dam, the jet belongs to Tom Cruise. But it isn’t Tom Cruise on board. Arnold Schwarzenegger’s own private jet is being serviced by engineers, so Tom Cruise puts out his own plane for Schwarzenegger to use. Arnold flies in, seeking out his pal Jean Claude Van Damme. 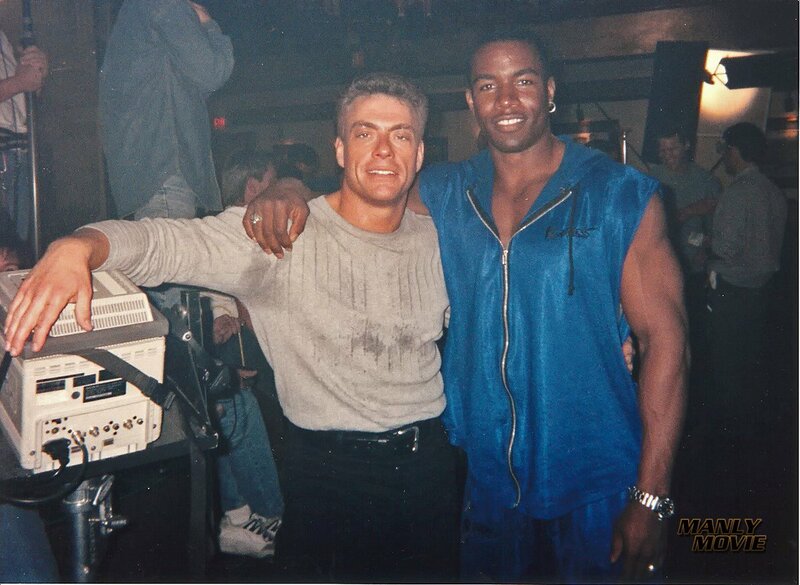 Van Damme greets him warmly and takes him on a tour of the set. 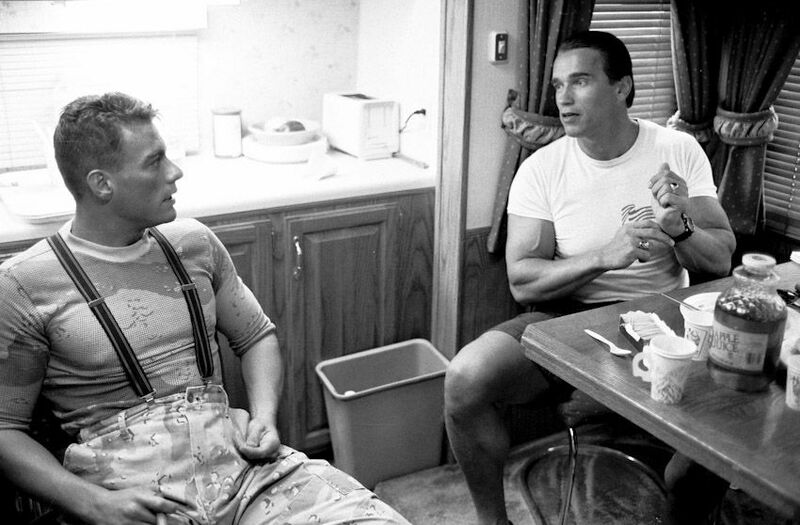 Having inspected the set, Jean Claude takes Arnold back to his private trailer for a lunch of chicken breast with pasta, followed by cigars for everyone. At the Cannes movie festival in France, Dolph Lundgren and Jean Claude Van Damme decide to pull some guerilla promotion and stage a show down at the event. The near-fight fails to convince many, but still contributes to creating ‘talk’ about the movie. Universal Soldier opens in theatres. It opens at $10,057,084 from 1916 theaters with a $5,249 per screen average, going on to take $36 million. It peaks at number 2 behind ‘A League Of Their Own’. Working off a $23 million budge, the movie is not considered a financial success. Universal Soldier is released in comic book format. A total of 32 episodes are released. In the series, Max Brewster has been implanted with the ‘Storyge Chip’. A chip which gives him an unlimited number of specialist skills instantly. When a surge of adenalin hits the Storyge Chip, the ‘time-slip’ is triggered and Brewster becomes who he needs, from the past, to survive. The Chip can turn him into any of the greatest warriors from the past, present and future and his own personality will not return until the threat he faces has been dealt with. A Universal Soldier video game was produced by The Code Monkeys and released by Accolade for the Nintendo Game Boy. The game was a conversion of Turrican II: The Final Fight for the Sega Genesis and Game Boy. A video game based on the Universal Soldier property in development for the Super Nintendo Entertainment System is cancelled. The game was set to be an adaptation of the earlier game released on the Nintendo Game Boy. A game for the SEGA Gensis does however find its way to release. The film is panned by critics and fans alike. The contorted franchise DNA of Universal Soldier begins to tighten. Despite ‘Universal Soldier 3’ readying for release later in the year starring Burt Reynolds, pre-production on Universal Soldier 2 begins, six months after Universal Soldier 2: Brothers in Arms. Subtitled ‘The Return’, the new movie will see Jean Claude Van Damme return. Further irony will see Michael Jai White return as co-lead, despite having played a soldier in the original movie. Coming off his success in the WWF, ‘Stone Cold’ Steve Austin is approached to play the chief henchman ‘Romeo’ in Universal Soldier 2: The Return. WWF owner Vince McMahon refuses Austin’s temporary release, as he will feud with future action superstar Dwayne ‘The Rock’ Johnson at the upcoming pay per view WrestleMania XV: The Raging climax. Casting looks elsewhere to rival promotion World Championship Wrestling, where rising star Bill Goldberg is granted temporary release to play ‘Romeo’. Filming begins on Universal Soldier 2: The Return in Texas and Los Angeles. The movie has a budget of around $40 million. An ‘injury’ is feigned by Bill Goldberg by the hands of Scott Steiner on WCW television to write him off screen to appear in the movie. Universal Soldier 2: The Return is released for a limited theatrical run. The movie performs poorly, totalling $10 million domestic. Ten days after its release, Jean Claude Van Damme appears on WCW Nitro to bolster the movie’s publicity. 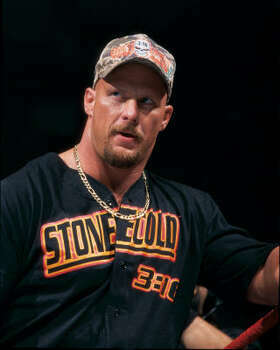 Bill Goldberg also uses the signature theme of the movie as his entrance music. Despite WCW’s plugging, it fails to offset the lack of promotion elsewhere and general negative feedback. Universal Soldier 2: The Return is released on DVD in North America. On VHS, Universal Soldier III: Unfinished Business is also released. The movies are narratively unrelated. The latter performs poorly and is received terribly by critics. The planned television show is cancelled. With Jean Claude Van Damme’s career having completely derailed, no more theatical movies are planned. The franchise will sit on ice for the next ten years. Moving way ahead to 2008 and almost ten yers later, word comes out of the blue that Sony looks at bringing Dolph Lundgren and JCVD back to begin filming another Universal Soldier movie. The movie is said to be titled Universal Soldier III: A New Beginning. Director Simon Fellows, director of ‘Until Death’ is attached to direct Universal Soldier III: A New Beginning. For now, both Dolph Lundgren and Jean Claude Van Damme are rumoured to appear but still not officially signed on. The movie is set to ignore previous events seen in the three VHS sequels. The newly titled Universal Soldier: Regeneration begins filming. Locations in Bulgaria fill in for Pripyat/Chernobyl in The Ukraine. The first images from the set emerge of a renuited Dolph Lundgren and Jean Claude Van Damme. Dolph Lundgren and Jean Claude Van Damme shoot for five days and 20 days respectively. John Hyams is confirmed as the new director. On October 1, 2009, a surprise screening of Universal Soldier: Regeneration takes place at the Fantastic Fest in Austin, Texas, U.S.A. The reaction to the sreening is positive. Although it was released in in Israel on January 7, 2010, followed by the Philippines on January 8, followed by both Bahrain and the United Arab Emirates on January 27, both Malaysia and Singapore on January 28, Universal Soldier: Regeneration is given its main release in North America on February 2nd. The film is received well and recoups its $10,000,000 budget. Having been received well, a sequel is announced to Universal Soldier: Regeneration. Titled Universal Soldier: A New Dimension, it will be the first in the series to be filmed in 3-D. John Hyams is also announced to return as director. Production begins for the newly titled Universal Soldier: Day of Reckoning. Previous rumours of Michael Jai White returning to the series do not prove to be accurate, whilst Scott Adkins enters the franchise as the movie’s main protagonist. Prior to production beginning, Scott Adkins suffers a knee injury which limits the fight between he and Jean Claude Van Damme, which was originally set to be more physical. Talk of yet another Universal Soldier reboot emerges. Once again attempts are brought about to remake the property into a TV Show. The Universal Soldier TV series will be penned by Damian Kindler and, they say, would have been brought to the small screen by Fremantle Media. Allen Shapiro and Craig Baumgarten, both of whom produced the original 1992 Universal Soldier film – directed by Roland Emmerich – would have executive produced the TV series. It would have been the second attempt to adapt the property to television. 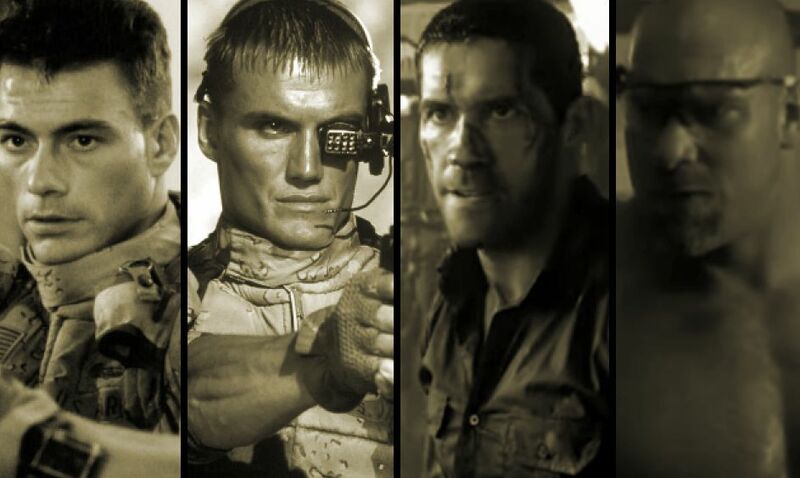 Universal Soldier: Day of Reckoning is released on video-on-demand. Reception is somewhat mixed. Some of the main points of contention were that the film deviated greatly from the general idea of a Universal Soldier movie, and that Jean-Claude Van Damme and Dolph Lundgren (considered the stars of the franchise) had very little screen time. However, ManlyMovie gives it the thumbs up – which is all that matters, yes? Universal Soldier: Day of Reckoning is given a small theatrical run starting November 30, 2012. It draws a modest $1.4 million, considering the small number of screens it debuted on. While not impressive next to its $8 million budget, the movie did do better on home media releases. In the timeline history, six years pass before we hear much about this series again. With the original arc apparently wrung dry (in multiple directions of cannon), the series was revealed to be undergoing a reboot. In October 9, 2018, Todd Black and Jason Blumenthal hired Richard Wenk to write the reboot. The story will focus on one resurrected soldier. Beyond that, no further information was revealed. But at this point we can say that the series is undergoing an early development reboot.